Besides thanks to Google Analytics, it was immensely gratifying for me to be able to learn fascinating facts about you – the visitors of the blog in 2012. The Top 10 visitor locations for BrandedNoise areSingapore, India, US, UK, UAE, Philippines, Canada, Australia, Japan & Germany. Of whom 52% have been New Visitors and 48% have been Returning Visitors!! Safari, Chrome and Firefox were the top 3 browsers via which you accessed BrandedNoise (with IE being a distant 4th!). No wonder. Google Organic Searches, ‘Direct Browser Access’ (special thanks to those who have bookmarked my blog), Facebook Referrals & Linkedin Referrals were the top sources of the traffic generated to the blog. It is super fascinating to even be able to see the actual ‘keywords’ searched for by the visitors who eventually ended up on the blog! There are many other insights that I could glean from my Analytics Page and I am sure these would go a long a way in helping me make your valuable time spent on BrandedNoise more worthwhile in the days to come. Thank you again for your encouragement and words of support through out the year. You have been a huge inspiration. As is the world of Brands, Innovation and Design. Wish You a Successful and a Purposeful 2013! 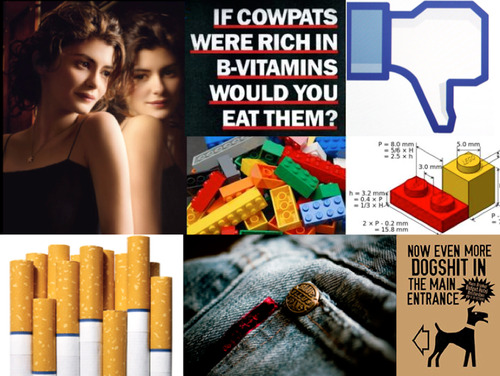 This entry was posted in Uncategorized and tagged Facebook, Lego, Listerine, Marmite, Microsoft Internet Explorer, Mouthwash, NASCAR, Skeuomorph, Social Dissonance, Stories, The New Theory of Constraint, The Worst Hotel In the World, Top 6 blogs of 2012. Bookmark the permalink.